Sustainable architecture doesn’t have to come at the cost of beauty. 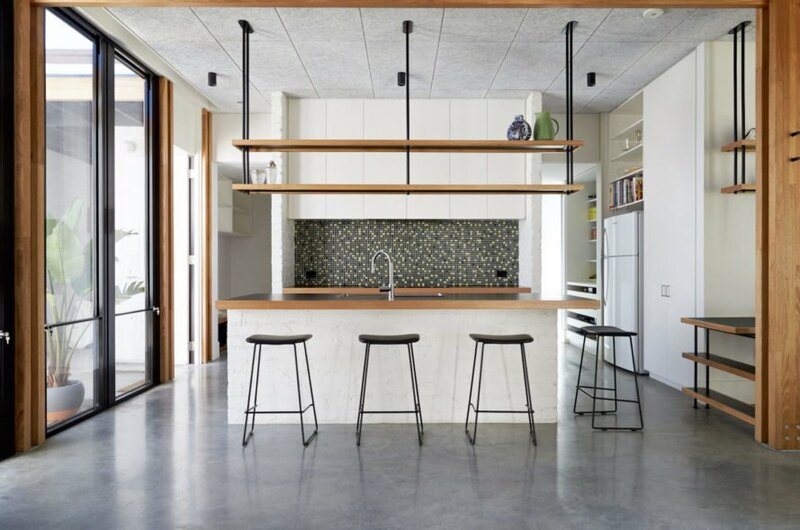 Take, for example, this lovely refurbished home in Melbourne with its elegantly exposed timber frame, modern decor, and eco-certified building materials. 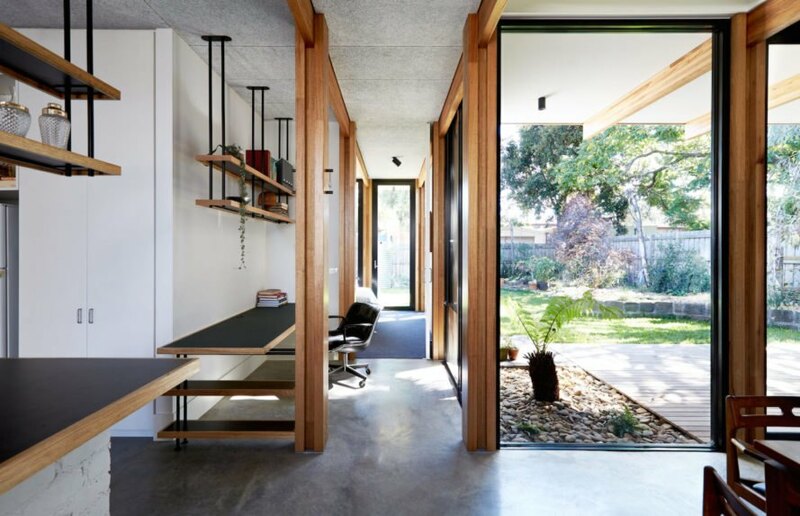 Foomann Architects led the redesign, titled Ballantyne Street, to meet the client’s brief for a sustainable home where they intend to live in forever. 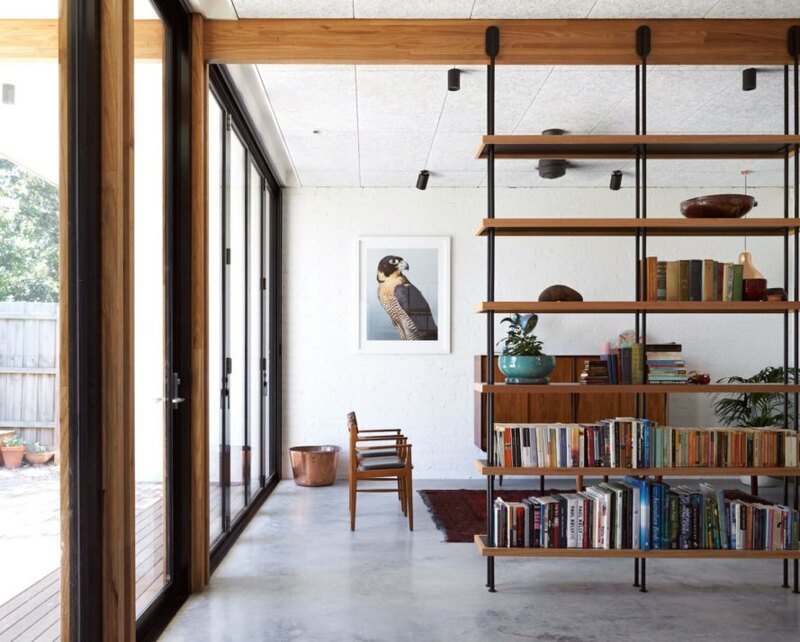 Foomann Architects preserved much of the single-story dwelling’s original structure, including the front, but replaced the 1990s extension in the rear with a more modern addition that houses an open-plan living room, dining area, and kitchen, study, as well as a new bedroom. The renovation and expansion accommodates the client’s family of five and visiting guests. 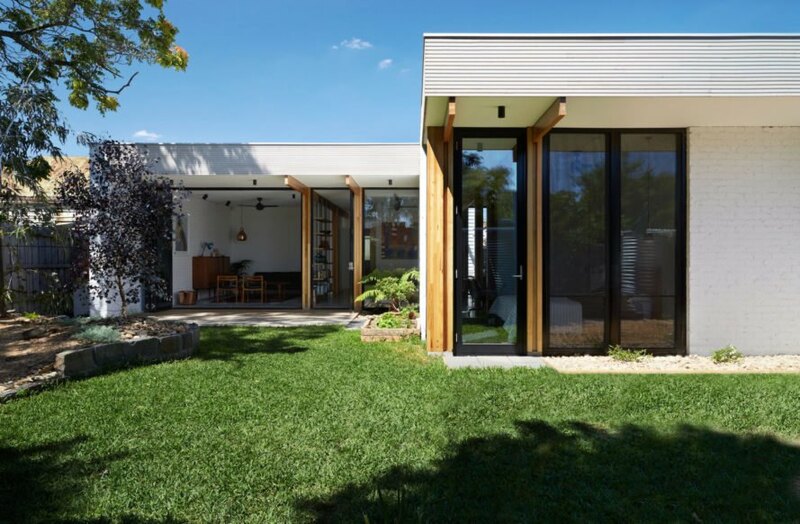 In contrast to the home’s original and rather unassuming frontage, the new modern addition is wrapped in full-height glazing that lets in natural light and views of a fenced-in backyard. “The design was approached in this context; to be no bigger than required and enduring,” wrote the architects. “This resonated strongly with our practice; every decision weighing up cost, longevity and environmental impact.” The modern addition features an interior mainly made of masonry and glass broken up by beautiful exposed timber framing—made of composite laminated lumber veneer—integrated with joinery, echoed in the furnishings, and extended across rooms to the outdoor spaces. The joinery is also integrated with concealed lighting for a clean and minimalist appearance. The dedication to sourcing eco-certified and durable materials as well as the design of compact room sizes earned the project a Commendation for sustainability in the ArchiTeam 2017 Awards. Foomann Architects preserved much of the single-story dwelling’s original structure, including the front, but replaced the 1990s extension in the rear with a more modern addition that houses an open-plan living room, dining area, and kitchen, study, as well as a new bedroom. 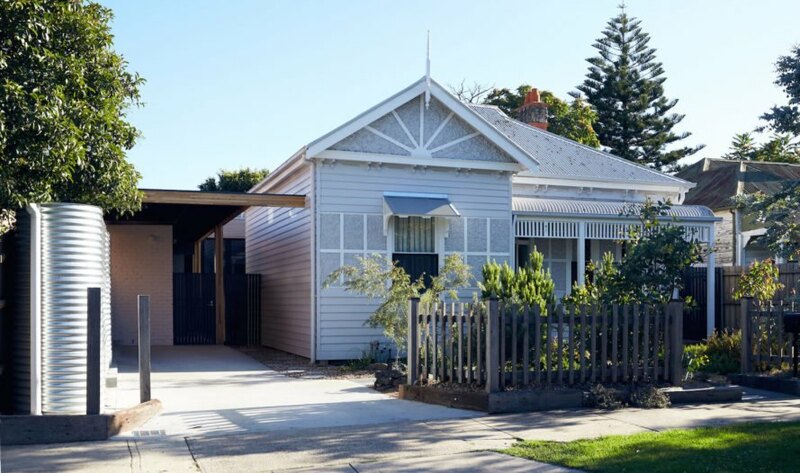 In contrast to the home’s original and rather unassuming frontage, the new modern addition is wrapped in full-height glazing that lets in natural light and views of a fenced-in backyard. 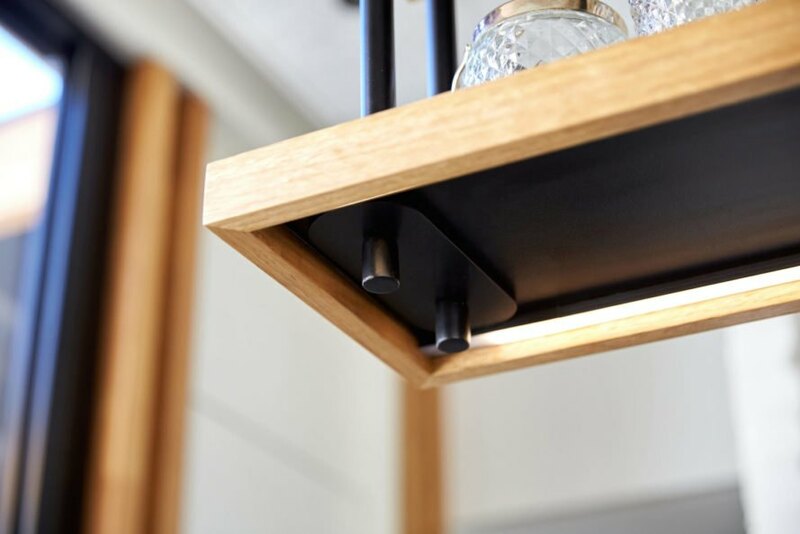 The joinery is also integrated with concealed lighting for a clean and minimalist appearance. The modern addition features an interior mainly made of masonry and glass broken up by beautiful exposed timber framing—made of composite laminated lumber veneer—integrated with joinery, echoed in the furnishings, and extended across rooms to the outdoor spaces.